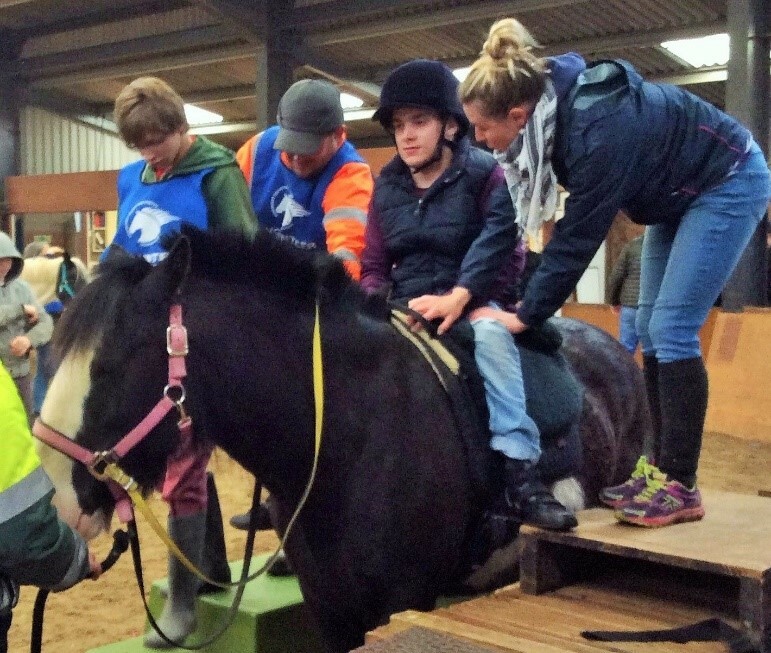 Our ethos is ‘Improving Lives’ – be it rider, volunteer, parent, horse… some of the people we work with have been kind enough to share their stories below. 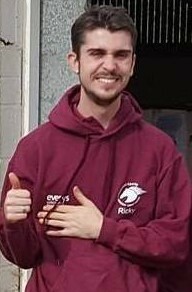 My name is Ricky and I am a Student at Conquest Centre. With the support of my dad/or Popz as he is known at home, I have written a few words to express ‘What Conquest means to me’. I have autism and memory impairment. Before I became a Conquest Student I was struggling at college and was fortunate to gain work experience with Conquest through the Princes Trust programme. After a matter of days into my work experience I knew, this is where I wanted to be. Although I had already completed animal and equine care at level 1, Conquest provided me with new experiences and a way of working with animals with specialist saddles, reins and approaches to their care. 1. Sign posting me to the use of the notice board for routines and allocated jobs. 2. Tasks broken down into manageable stages, which is confirmed and checked before I move onto the next task. 3. And positive reassurance and direction with every task with a duty member of staff I can go to for advice and further direction at any time. I am also prompted to eat and drink as I can often forget and get easily distracted, but that’s another story! These strategies have helped me to gain confidence throughout the 10 months I have been at Conquest Centre and become a little more independent to carry out the daily routines. I have also helped steward an event day last summer and was assigned a horse called ‘Tommy’ to conduct all the health checks needed and general grooming, observing for any change in behaviours and reporting back any concerns I may have. Tommy can be stubborn and challenging at times, which has helped me develop a kinship with him. I guess it wasn’t that long ago I was very much the same! He is also the horse I ride when I have my riding lessons, which is another huge positive for me, learning to work in partnership with him. It has helped me to relate to how the other clients must feel whether it is their first or 40th time, each finding their own special experience. I am also working towards the BHS Stage 1 Certificate in Horse Knowledge and Care, allowing me to be further supported, and continue to work towards new achievements, as well as reinforcing what I have already learned. I feel as though I have grown as a person and feel less isolated, that I am part of a team and valued for my contributions. Before Conquest I did not look for social interaction or activity, but now I have the satisfaction of meeting many new characters, and seeing those less abled have positive and exciting experiences, which I am proud to be a part of. I consider myself very lucky to have found a place where I feel that I belong, having the ability to work in an environment that I love and with people that make it their business to give me time, understanding and develop me to reach my potential. Eddie is 29 years old, has cerebral palsy and is unable to walk unaided. This condition is deteriorating and within the next 10 years he may well be wheelchair bound. Additionally Eddie has autism and has no formal method of communication. This causes frustration and anxiety on his part and makes it very difficult to care for him. Eddie has been riding since he was three years old. Conquest Centre is the best riding centre Eddie has ever used. The indoor arena allowing all weather riding is fantastic as autistic people do not understand when their planned activity doesn’t happen. The physical benefits of having his tight leg muscles and tendons gently relaxed while on horseback are enormous. Eddie resists daily Physio stretches by his carers – so riding is sometimes the only stretching he has. His walking is so much easier after a riding session. Indeed we were told 10 years ago that Eddie’s walking days were nearing an end – but riding has kept him going! The emotional benefits are equally large, his sense of achievement in getting on the horse, his delight at sitting tall in the saddle and the thrill of trotting are all wonderful to see. Conquest are expanding their support for disabled people in so many ways (eg they have recently opened a Café run by trainees with additional needs) and we meet parents who have travelled from Bristol, Yeovil and Bridgwater to attend sessions with their children – it is simply the best!